The field of legal translation and interpreting has strongly expanded over recent years. As it has developed into an independent branch of Translation Studies, this book advocates fora substantiated discussion of methods and methodology, as well as knowledge about the variety of approaches actually applied in the field. 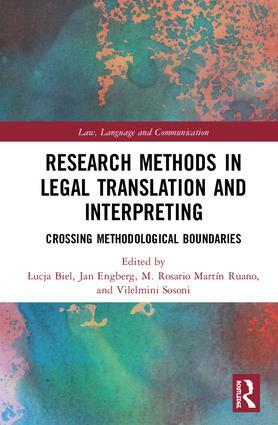 It is argued that, complex and multifaceted as it is, legal translation calls for research that might cross boundaries across research approaches and disciplines in order to shed light on the many facets of this social practice. The volume addresses the challenge of methodological consolidation, triangulation and refinement. The work presents examples of the variety of theoretical approaches which have been developed in the discipline and of the methodological sophistication which is currently being called for. In this regard, by combining different perspectives, they expand our understanding of the roles played by legal translators and interpreters, who emerge as linguistic and intercultural mediators dealing with a rich variety of legal texts; as knowledge communicators and as builders of specialised knowledge; as social agents performing a socially situated activity; as decision-makers and agents subject to and redefining power relations, and as political actors shaping legal cultures and negotiating cultural identities, as well as their own professional identity. and corpus linguistics. She has published over 50 papers in this area, e.g. in The Translator, Meta. The Translators’ Journal, The Interpreter and Translator Trainer, Fachsprache, LANS-TTS and a book Lost in the Eurofog. The Textual Fit of Translated Law (Peter Lang, 2014). of a substantial number of international scholarly journals.